Think Dark Sky for your Apple TV. For several months on my new Apple TV I’ve been searching for a decent weather app that doesn’t cost too much, and truth be told I really haven’t been able to find any. My go-to weather app has been Carrot Weather for quite some time, but I don’t love the interface on a big television screen. So I was eager to try out Forecast Bar for Apple TV, which offers some standout features and lots of forecast detail. We reviewed Forecast Bar for Mac back in September and declared it the closest thing possible to getting Dark Sky on your Mac, and it still is. Dark Sky, known for its down-to-the-minute precipitation forecasts, has become a favorite weather app on iOS and Android. So let’s see if Forecast Bar for Apple TV is the closest thing to getting Dark Sky on the big screen. 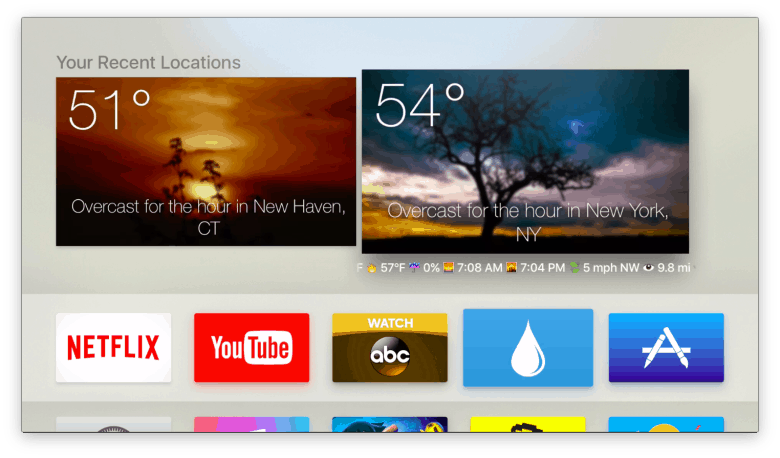 The big selling point of Forecast Bar for Apple TV is that it supports Home screen widgets. If you place Forecast Bar in your Apple TV’s first row of apps, it gives you a glimpse at the weather forecast for your most recently viewed locations without opening it. You can see current temperature and conditions, plus the day’s high, low, chance of precipitation and more. It’s super handy to view the weather at a glance. Widgets give you a look at the weather without opening the app. 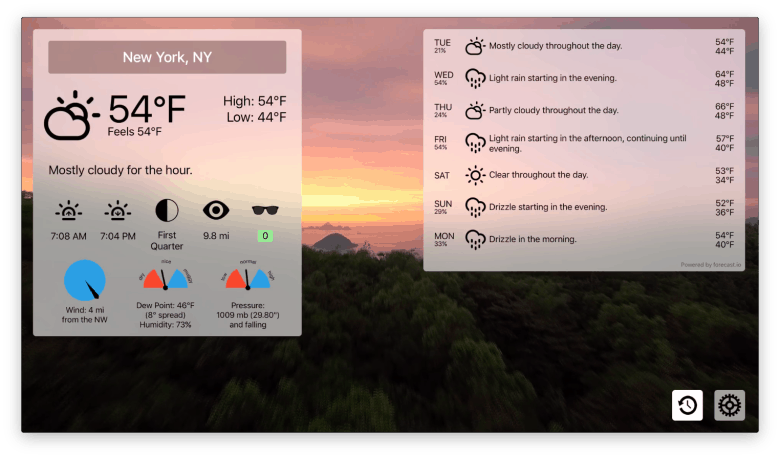 Open up the full app and Forecast Bar displays the current weather and seven-day forecast over beautiful footage from nature. Over on the left side you’ll find the current temperature, high, low, sunrise, sunset and other fine details like visibility, wind and dew point. On the right, you can scroll through the extended forecast with a brief description for each day. But click on a day to expand even more details for hourly precipitation, wind, humidity and UV index. This makes Forecast Bar by far the most thorough weather app on the Apple TV. I’ve tried numerous Apple TV apps and none come close to this in terms of amount of detail. To answer the question, yes, this is about as close as you’ll get to Dark Sky on the Apple TV. In fact, Forecast Bar uses the same data from Forecast.io as Dark Sky. It even looks a bit like Dark Sky, too, with its monochrome icons and what not. Time Machine can bring you back to a time before we were doomed by global warming. Other features of Forecast Bar include the ability to save and quickly swap between different locations, which are all present in the Home screen widgets too. 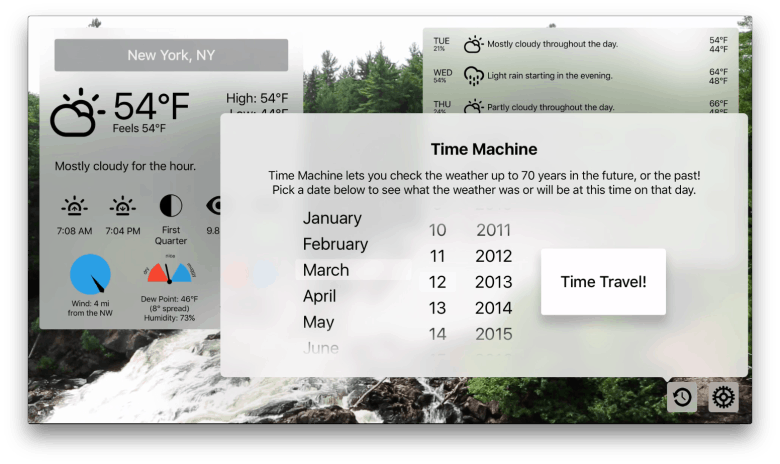 Plus, you can use the Time Travel feature on the bottom right to pick a date and go back in time to see the weather that day. Forecast Bar is also highly customizable. It supports dozens of languages, has a 24-hour clock, colored icons (instead of the monochrome), still photo backgrounds instead of videos, and even a dark theme reminiscent of OS X’s dark theme, which I think I might prefer to the light theme for a TV app. Forecast Bar breaks down precipitation by the hour. Widgets work well and forecasts are accurate and extremely in depth, so there isn’t much to dislike in Forecast Bar. I wish the font size for the extended forecast was a little bit larger — it seems a tad small on my 32-inch TV, but folks with larger screens should have no problem. Forecast Bar for Apple TV sells for $4.99 and it syncs settings with the Mac and iOS apps too. It’s one of the best weather apps available for the Apple TV at the moment, so if you have five bucks, give it a whirl. Search “Forecast Bar” on Apple TV to buy it.